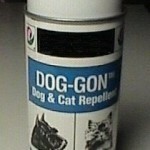 PRODUCT DESCRIPTION: Light aerosol with no odor detectable by people but apparently is detectable to cats and dogs. Most important, they don't like it much and will stay away from any object which has been misted with it. WHERE TO USE IT: Better suited for use in the home, this product can be used outside on plants, house siding, furniture or any object you wish to protect from dogs. In the home, it is ideal for treating couches, chairs, rugs, curtains or any area you wish to keep dogs off or away. Just lightly mist it over the sight and dogs will stay away. Renew as needed. This could be daily for a week or so until they give up on trying to access whatever it is you are trying to protect. Applications won't harm people or pets; just keep them away when doing the application. Once dry, which is usually in about 5 minutes, animals and people can walk over or touch treated surfaces with no hazard. If you want to spray some type of fine fabric, be sure to test a section of it first making sure there are no adverse reactions or discolorations. Though this has not been reported, we always advise you to test it first before randomly applying some. RATE OF APPLICATION: Light misting on objects you wish to protect. A light misting means just a second for every sq/foot of area is plenty. Once applied and dry, you won't be able to notice it is there is done right.